Hunting – Getting the most from the experience. Often I hear the phrase ‘take it hunting’ in regards to a horse that is a bit stuffy, a rider who needs more confidence or a horse who just needs a bit more education to help with the rigours of cross country. 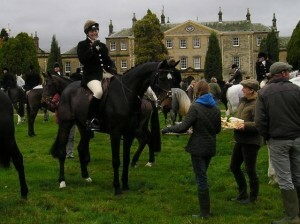 Though hunting is often a really useful way to educate a horse, it takes time and effort to get a good hunter. This is my guide on how to get the best from your hunting experience in order to maximise it for eventing. If I have not got time to go Autumn hunting then I choose quieter meets (speak to the hunt secretary who will be able to advise). I also never make plans to go out for the whole day. The worst thing you could ever do is to attend a children’s meet! They are hectic and not a great starting point in educating your horse for the longer term.y. Everything is kept very calm with young horses and if they get twitchy I will walk them round or try and stand them next to a more experienced horse. 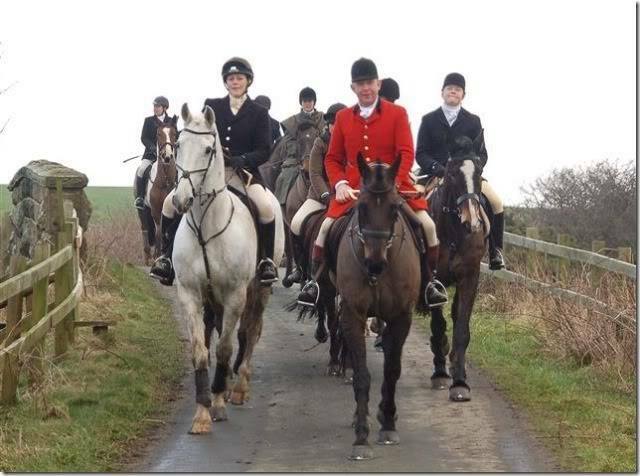 I never let them go to the front the first couple of times out hunting and instead stay towards the back going slower and letting them get used to waiting for gates to be shut in small groups of horses and watching the field canter off. I will also do the same with jumps and will wait towards the back as I hate them getting over excited if you have to queue for a fence. If they are really green, I try and make sure I have a reliable friend who can give me a lead as you will often encounter people having issues getting over the fence. If they are getting over excited and becoming ridiculous, I will remove them from the situation. I usually make a decision depending on their behaviour about whether they need to go home or just be removed from the situation to get their brain functioning again. My current horse had to be removed from the situation about three times because after several canters across and field and then a break he could not stop his brain whizzing and would try to spin rather than stand. Now he is a delight to hunt but he was never allowed to blow his top or for it to get too much. This approach takes discipline but long term it works. I prefer to overbit for hunting than underbit. There is nothing worse than being sat on a horse pulling your arms out. Unlike cross country you rarely get combination or turning fences so if you have slightly over bitted it will not be so detrimental as it could be cross country. Ultimately if you have got it really wrong in the bitting department then you do not need to jump. Make sure you wear a ribbon – green for novices and a red for a horse that might kick. There is nothing worse than being stressed about people going up your horses hindquarters and not knowing if you will be launched into space. Its another reason why hanging out at the back is preferable to being near the front so you can teach your horse about lots of people in close proximity without stressing them out. I always hunt my horses in boots – its my preference because I have seen some very nasty tendon injuries from slicing into the back of the tendon over ditches (which is what we jump in Somerset). I tend to use boots with tendon protection in front and double lock brushing boots behind but we are not a fast pack so legs do not get put under the same rigours as some of the faster packs might. I do not use over reach boots unless the horse needs them. There are pros and cons about boots out hunting so its down to personal choice and the type of country you will be hunting over. One of my personal things is to put my mobile phone in a plastic sandwich bag before I put it into my pocket. Hunting over ditches means you could take a swim if things go wrong and I would be pretty fed up to ruin my phone! It also protects it from rain. 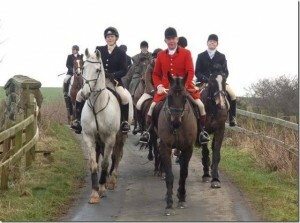 The best thing to do out hunting is to be cautious, until both you and the horse understand the whole process. It will be better for the longer term confidence and enjoyment of both horse and rider. If in doubt about taking your horse hunting speak to your trainer. 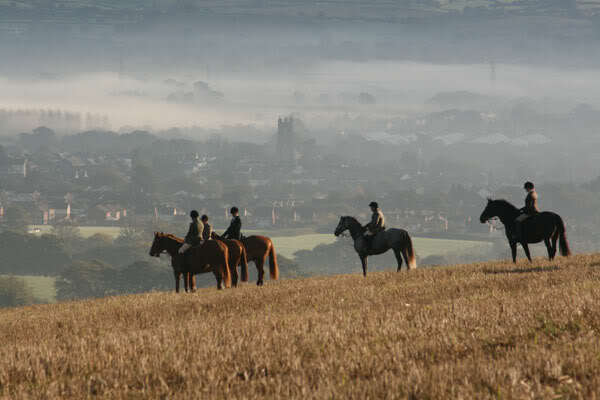 A great days hunting will give you confidence, a better eye to a fence, a better relationship with your horse and is a great way to spend the day. A bad days hunting, can unravel everything and leave both horse and rider with a severe dent in confidence.